Mirrorless camera lens is the most sought after lens in the market. If you enjoy taking pictures using selective focus, then you will surely love the Trio 28 which is the new lens by Lensbaby. The Trio 28 is a mirrorless camera which has three different lens in a single lens. You can select your preferred lens using a rotating dial design which is available on the lens. The effects that are available are known as 'Sweet, Twist and Velvet'. 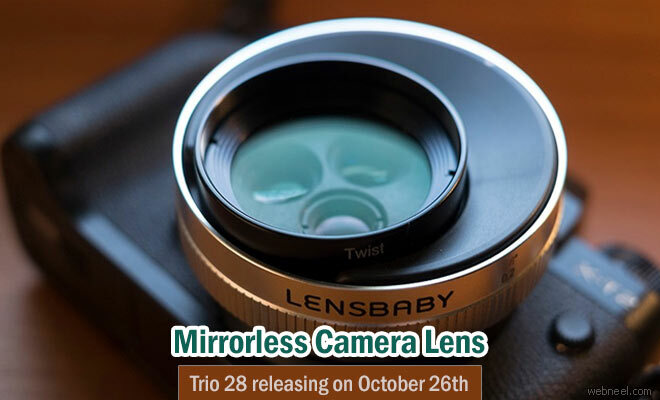 If you look at the pricing of Lensbaby Trio 28, it's neatly priced, since you get three lens for one. Trio 28 is available for $279.95, along with one of these cameras,'Sony E(mirrorless), Fuji X(mirrorless), Micro(4/3) mirrorless'. It's all set to release on October 26th, 2016. Trio 28 – where convenience meets creativity. Designed specifically for mirrorless camera users, the Trio 28 features three selective focus optics in one compact lens design. Trio 28’s wide 28mm focal length uniquely captures the soul of street scenes, landscapes, environmental portraits, and more. Simply rotate a dial to choose your inspiration from our most popular creative optical effects. Sweet creates a sharp central sweet spot of focus surrounded by gradually increasing blur.